Each Friday of 2007 I intend to snap what is before my eyes at four oclock. I am not actually saying A.M or P.M. as I want to keep it open for myself, though I think it'll be more often 4pm but if it is both that will be fine. The rain stopped, the sky cleared, the wind did not drop and myself plus RnB walked along the river path. At four I found myself discovering a waiting room :0) Goodness knows who or how these skeleton chairs arrived at this place. Would be fun to have 'someone' just prising them apart for the all important meeting between stone river and tree. I loved the echo of autumn in their rust guilded shape and the space for spring to begin to capture and transform the scene in and around them. I'll go back and check if a table has arrived or the empty sign has been pinned up again in the next week or so. 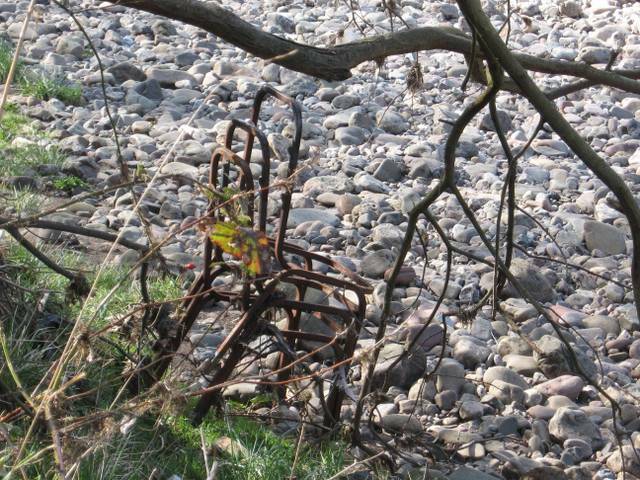 There you go, DW - as only you could - creating poetry out of abandoned chairs. I loved this!